This year we hope you will be able to support our mission by donating! #GivingTuesday is a global day of giving that harnesses the collective power of individuals, communities and organizations to encourage philanthropy and to celebrate generosity worldwide. 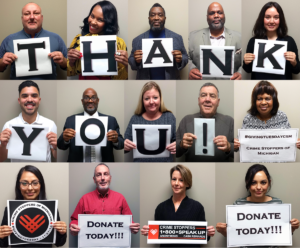 This year’s #GivingTuesday will take place on November 27th, following Thanksgiving and the widely recognized shopping events Black Friday and Cyber Monday. Since 1993, Crime Stoppers of Michigan (www.1800speakup.org). has been dedicated to bridging the gap between residents of Southeastern Michigan and law enforcement. Our mission is to empower people to make their neighborhoods, schools, houses of worship and business safer throughout our seven county service area (Livingston, Macomb, Monroe, Oakland, St. Clair, Washtenaw & Wayne counties respectively). Our service area encompasses 4.5 million residents. – Through tips we were able to help solve 98 homicides and 77 sexual assaults, caught 283 wanted fugitives. It is important to understand that behind all this data are real people, much like you and me. Fathers, mothers, brothers and sisters, grandparents and others who were unfortunately touched by crime and their lives will never be the same again. But with your help, as well as the help of the entire community, we will continue to make our region a better place to live, work and play. Every dollar makes a difference! Your contribution can make an impact, whether you donate $5 or $500; every little bit helps. Crime Stoppers of Michigan an independent 501 (c) (3) nonprofit organization. We do not recieve funding from the state or any other government agency.